Craig first saw me in August for help with his constant sinus congestion. 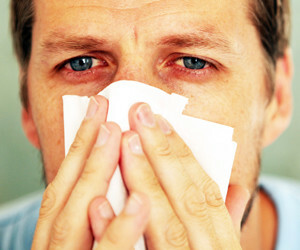 Sinus congestion can be caused by a multitude of different things and the culprits vary with the time of year. In order to find out what his stressors were, we had to do lots of investigative testing! In August, we tested ragweed and other weeds, sinus membranes, nasal mucous and mucosa, dust and dust mites and fur from his pet cat. We placed all vials on the electro-acupressure machine, sent their frequencies into Craig's body along specific pressure points (which allows his body to properly recognize the substances) and muscle tested again after running the machine. The vials now achieved a strong muscle response. Over the next few days, his congestion improved but returned in late March just as winter was ending. Although manifesting as the same symptom, it was clear that Craig had more than one cause of his congestion and that is why he was triggered at several different times of the year. Now we had to figure out his triggers for late winter. I see many people who feel their "seasonal allergies" starting just as the snow has melted for the season. But nothing is in bloom at that point so the cause is not plants and pollens as they suspect. Underneath the snow is mold. When the snow melts, the wind picks up the mold and blows it around; causing reactions. I saw Craig again in April. We tested 77 different molds and he was sensitive to many. We also tested for a sensitivity to high and low barometric pressure, condensation, precipitation, fire gas and smoke and furnace fumes. We balanced all substances using the electro-acupressure machine. While Craig was on the machine he immediately felt his sinuses begin to clear. Over the next few days they had cleared completely and he has not had nasal congestion since. "I used to be constantly congested and it was even worse just as winter ended. It was caused by a sensitivity to mold. During the appointment, I noticed my sinuses were starting to decongest. Over the next few days, my sinuses continued to decongest to a point I have not experienced in decades. I can breathe! The puffiness around my eyes has started to decrease. I feel so much better." If you suffer from nasal congestion, Contact Us and give Bioenergetics a try.